If you had wandered in to the new Brewery Shop at Fuller’s historic Griffin Brewery last Friday (14 Sept), you would have seen Fuller’s employees and guests alike queuing up in anticipation to try one of the five new beers brewed on the recently installed Pilot Brewery. The pilot brewery is an exciting addition for London’s oldest family brewer. 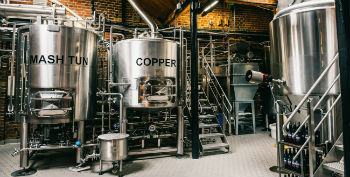 It was installed earlier this year, and has an infusion mash tun, a copper/whirlpool with an external wort boiler, four fermentation tanks and two bright beer tanks – all provided by Gravity Systems Ltd. The new plant produces around 10 barrels (40 firkins) of beer per brew which can then be packaged in bottle (by hand), cask or keg. Brewing commenced in August and offers its brewers the opportunity to create some more experimental beers in small quantities. Fuller’s has been calling out for a pilot brewery for years and with the new shop creating suitable space, we finally have one. Located at the back of the shop, behind glass windows, it’s an added spectacle to the Fuller’s Visitors’ Experience, which is attended to by thousands of guests every year. The Visitors’ Experience, which includes the Brewery Tours and Shop, has had a recent re-brand and now carries the tag line ‘Experience the Works’. It champions all things Fuller’s – beer, brewing, and pubs.